Are you confused about Net Neutrality? Who isn’t? Some people argue it is necessary for continued innovation on the Internet, and point to Comcast’s bandwidth metering as a sign of things to come. Others claim that it is unnecessary regulation that will create unintended consequences in its wake. 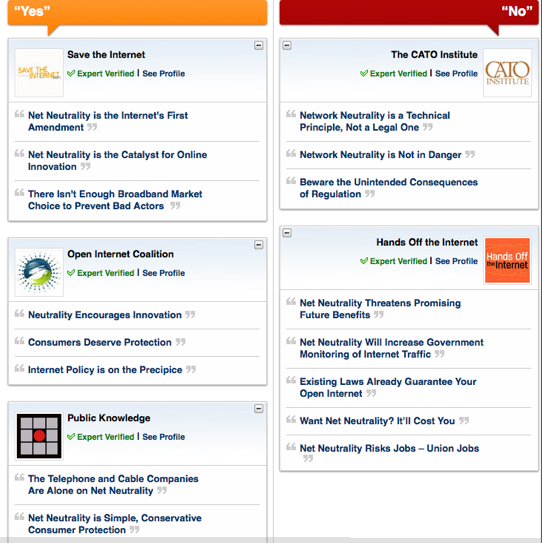 Opposing Views, the debate site that pits experts against each other to argue the pros and cons of the big questions of the day (read our launch review), last night put up a page on Net Neutrality. The page lays out the arguments pro and con for Net Neutrality, and then links to fuller arguments. Marshaling the arguments for Net Neutrality are the Save The Internet Coalition, the Open Internet Coalition, and Public Knowledge. (It’s a freedom of speech issue, the ISPs are quasi-monopolies that cannot be trusted, innovation on the Web is at stake). Arguing against are the Cato Institute and Hands Off The Internet (it’s a technical issue best left to engineers, the cost of Net Neutrality will be passed onto consumers, regulation will backfire). Readers are then encouraged to vote on who is winning the argument, an add their own points of view, which can be elevated to the main discussion page. Too often, the discussion of why we need to protect the open Internet degenerates into a stale debate about regulation versus the free market. In fact, it’s impossible for innovation to continue apace without some basic rules of the road to protect that innovation. The open Internet was the principle leading the development of the Internet as the first open global communications network. And it helped drive the development of a host of Internet applications like Facebook, YouTube, and Skype. There would have been no motivation for the developers of these applications to have expended time, effort, and in some cases, their own financial security, in pursuit of their vision if they weren’t guaranteed their inventions would have been able to work over any Internet connection. it’s important to remember that network neutrality is fundamentally a technical principle. Like any technical principle, it is fuzzy at the edges.
. . . Leading network neutrality proposals contain numerous ambiguities that would create uncertainty for everyone in the Internet industry. Here’s just one example: the most prominent network neutrality proposal of the 2006 congressional session, known as Snowe-Dorgan, defined a “broadband service provider” as “a person or entity that controls, operates, or resells and controls any facility used to provide broadband service to the public, whether provided for a fee or for free.” Does this mean that the owner of a coffee shop with a WiFi connection would be subject to FCC regulation of its firewall configuration? One would hope not, but that’s what the language seems to suggest. The same point can be made with respect to hotels, Internet cafes, airports, and even individuals who choose to make their home WiFi connection available to their neighbors. Where do you stand on Net Neutrality? Go debate.